RoohAfza is a popular way to break the Ramadan fast for Muslims during the holy month. 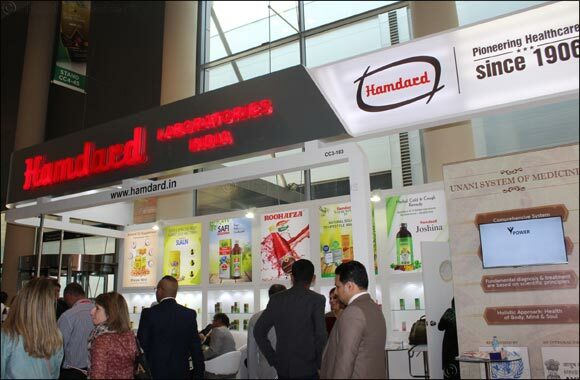 February 19, 2018; Dubai, UAE: Hamdard Laboratories, India, a 111-year-old iconic and a highly trusted FMCG company of the country, has launched its flagship and popular drink brand RoohAfza in the UAE market. The announcement, which was made at Gulf Food expo in Dubai, marks the brand’s first outing in the UAE, with a promise to see other popular brands from the company within this year, the next one being Safi, the unique skin cleanser and blood purifier from Hamdard. Roghan Badam Shirin, Joshina, Sualin, Cinkara tonic and the huge range of Unani products will be launched over a period of time. RoohAfza from Hamdard Indiahas a massive heritage and following and is a highly differentiated beverage evoking strong sensorial affinity and nostalgia mainly amongst the Indian diaspora as well as the existing customers. The brand also intends to appeal to newer segments with focus on the local and global consumers residing in the Gulf. It is now available at all leading supermarkets and grocery stores across UAE in a pack size of 750 ml. Speaking at the launch event, Mr. Mansoor Ali, Chief Sales & Marketing Officer, Hamdard India said, “RoohAfza enjoys a 45% market share in India within its category. With Multiplex International as strategic partners for UAE, we have already made inroads into the market by forging critical relationships with the modern and general trade. Consumer activation and awareness through sampling will be key, as we intend to have a large chunk of the UAE population actually experience the magic of Indian RoohAfza. In fact the sensorial experience and the refreshment coming from the therapeutic essence of the herbal ingredients of RoohAfza are unbeatable, and evoke a sense of deja vu every time it is consumed”. Reiterating drink’s popularity in India, Ali said, “RoohAfza has been growing at a phenomenal rate of 20 percent year-on-year when the FMCG industry itself is only growing in single digits. Moreover RoohAfza controls nearly half of India’s concentrated syrup market worth about Dhs 600 million (approx 1000 crore rupees)”. The secret of RoohAfza’s success and growth could perhaps be attributed to company’s decision to stay with the original flavor and recipe over century when the average consumer is actually spoilt for choice. Fueled by the ambition to innovate & delight consumers, last year the company launched RoohAfza Fusion in India, a unique combination of RoohAfza with pure fruit juice. In addition to the product concept, the product formulation too is quite unique & comes from the Herbal/ Unani roots of RoohAfza. It is in line with the massive transformation that is happening at Hamdard Laboratories. With the launch of this brand, Hamdard endeavors to target the youth who aspire for convenience, ‘cool’ & on-the-go formats. “We may soon be launching our Fusion line in UAE and Gulf region too as the population here looks for conveniences, on-the-go and healthier alternatives”, concluded Ali. According to the traditional Indian medicinal system of Ayurveda, Rooh Afza has therapeutic and nutritional qualities that work on the body particularly well in summer. It supplies essential electrolytes and corrects the function of the heart, liver and kidney. The qualities have, in fact, also made RoohAfza a popular way to break the Ramadan fast for Muslims during the holy month. A refreshing concoction, RoohAfza is a thirst quencher and a great additive for mocktails and desserts. Besides cooling, it is also nutritional and maintains as well as adjusts the body’s water level. Apart from mixing it with water and drinking, the popular concentrate can be mixed in milk, fresh lime or yoghurt, plus it has other uses, such as being the vital ingredient in home-made ice cream, sorbet, slush, smoothies and sundaes that definitely excite youth.